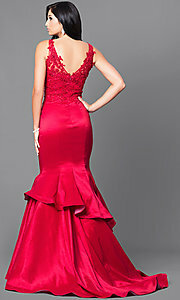 Unfortunately, the dress you are looking for (Style: DQ-9457, Name: DQ-9457) is no longer available. 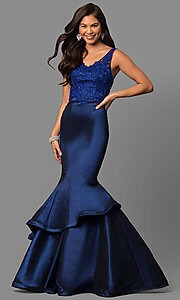 Be a star in this long mermaid prom dress with an abundance of dramatic details. In shimmering satin, this elegant formal dress is richly designed with sparkling embroidered lace on the fitted bodice. Beautiful beaded appliques adorn the sheer-illusion shoulder straps on this long v-neck dress and trim the v-back detail before cascading down to the natural waistline. The floor-length fitted mermaid skirt hugs your curves before flaring out in dramatic layers. Available in misses and plus sizes for prom or military ball, this long mermaid prom dress will steal the show as you make your grand entrance at your formal event. The model is 5' 10" and wearing 6" heels.